Q: Dear Guruji, do you really like being a Guru? And do you read all our botherations or do you have helpers? Sri Sri Ravi Shankar: There are helpers (smiles mischievously). Do you feel free of your botherations? How many of you feel free from your botherations? (Many raise hands in the audience). Q: What do you think of politics? Do you think people should get involved in politics? Sri Sri Ravi Shankar: What is politics? Caring for people, isn’t it? Politics means one who stands up for the people, one who cares for people. People who are caring should be in politics. Not the ones who are selfish, but the ones who care, yes! Unfortunately, of late, that is not the case with many. People come to politics just to enjoy some power, not to empower people, not to serve people. So it is good if you have an intention to serve the society, and if that is your cup of tea, then you should do it. But if you are a businessman and your tendency is to do business, you should not get into politics. It is the same with a philosopher or a doctor. See your aptitude. If you have a big vision for the people, the country, or the world, then I would encourage you to get into politics. Especially the younger generation should get involved in politics. Q: Guruji, a mistake was done in my past and I regret it. But I am reminded of that mistake by other people in every possible situation, even those who are unrelated. Sometimes I feel miserable and wonder if leaving this world is the only solution for me. Please help. Sri Sri Ravi Shankar: Absolutely not. Never do that. We are all here with you, I am with you, and everybody here is with you. Never mind. Whatever has been your past, believe in your innocence in the present. Mistakes happen because of ignorance, lack of knowledge, lack of awareness; some craving or aversion due to which you committed a mistake. That is done, finished. The moment you realize a mistake, you are out of it at that moment. So, don’t be too hard on yourself. And never ever think of ending your life. Got it? And if you find someone else also doing that, just bring them to the Part 1 course. Let them do breathing, let them meditate and you’ll see they will also get out of this tendency. 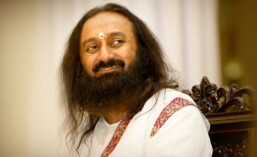 Q: Dear Guruji, what do I do when someone bothers me even when they don’t intend to do so? I can’t help being upset, even though I try not to be, I get angry for days. Sri Sri Ravi Shankar: Oh! Do Bhastrika. That will take you out of that mood. Sudarshan Kriya, Bhastrika – that is it. You will come out of it. Q: Guruji, we’re told that meditation is relaxation, not concentration. So when we have thoughts during meditation, is it still relaxation? Sri Sri Ravi Shankar: Yes! When you become aware of the thought, you take a deep breath in and let go, and you find that the thoughts have already passed. Meditation is not concentration. The more you try to chase away a thought, the more it comes. The best thing to do is to give that thought a hug and you will see that the thought disappears, like a bubble. Thoughts come like this, right? (Sri Sri holding a soap bubble gun pointed at the audience with bubbles pouring out). See how long they stay (referring to the bubbles in the air). They just come and vanish. All our worries are also like this. Never mind if these worries come. Just look back in the past and see; haven’t you worried ten years ago? You are still alive. You were worried whether you will see 2012, and you are seeing 2012! When you see the movie that the world is going to collapse in 2012, you think, ‘Oh my God!’ It makes you so nervous. But I tell you, everything will be business as usual. Sometimes you have to shake up and wake up, and be bubbly! Q: Dear Guruji, why are there religions? I know that they are there to keep us sane and have something to believe in; but why do people feel so strongly that their beliefs are right and others are wrong? How do we know if any of them are right? Sri Sri Ravi Shankar: You know, people want an identity, and they hold on to religion as an identity. Once you identify with one religion, you find that those who do not belong to that religion, no longer belong to you. They are separate; they are different. And that is how strife has started happening; wars have happened in the past. Human beings want an identity, and it is simply an identity crisis, whether it is language, religion, nationality – it is all a play of ego. One doesn’t say this religion is good because it is good, they say it is good because I belong to that religion. It is my religion, so it is better. This is where you see clearly that it is an identity crisis more than religion itself. All religions point out to one thing – Love and brotherhood, existence of a supreme power and prayer to that power, confidence in humanness and confidence in the goodness of human beings. However, people have left the spiritual aspect of religion and are holding on to the outer shell, and so they are all fighting. There was one Jesus but today there are seventy two sects of Christianity. There was only one Prophet Muhammad, but today there are six different sects of Islam. Lord Buddha was only one, and today there are thirty two sects of Buddhism. And in Hinduism, countless number of sects! There are so many schools of thought that you cannot even count them. What I would say is that we have to rise above our religious identity and recognize spirituality. Spirituality is experience. Once you have the experience of peace, tranquility, love and quietness deep within you, you will find that the same knowledge is said in all the religious scriptures. So, I would say that you need to be like an ant. If there is a mixture of sand and sugar, do you know what the ant does? It separates the sugar and the sand, makes an anthill out of the sand and consumes the sugar. We need to do the same thing. That is discrimination; that is reasoning. You know, often the places of faith shun reason. And those who take pride in being very reasonable, they don’t value faith. Life will be handicapped in the absence of any one of them. You need both faith and reasoning. And that is what spirituality is. Spirituality is faith and reasoning together, enriching both heart and mind. The Orient had a different approach. It said, ‘First you have an experience, and then, if you want, you believe.’ And that is perhaps why science flourished in the Orient, because science also has the same methodology. What does science say? ‘First you experience it and then you can believe it.’ And that is the one reason why scientists were never prosecuted in the east, in the Oriental philosophy, because the parameters were the same for both faith and science. They never got into conflict. However, in the Occident, they were always in conflict.